I am not in the used, rebuilt, or new tractor parts business. I do not have a complete inventory of tractor parts. However, I always have some "stuff" on hand (just ask my wife). Other than a few rare items, new and used parts for the 1939 to 1952 N-Tractors are generally easy to find and usually surprisingly inexpensive. It's easier to find parts for these tractors than many of the more recent tractor models. Why is that? These tractors remain very popular today. Many are still in use. Ford made many more of the N-Tractors than any other model. Many parts are interchangeable from 1939 to 1952. In most cases it is better to choose used or rebuilt original parts over any new replacement parts. The exceptions to that may be new cast iron manifolds from Canada, and new "restoration quality" or "just like original" parts. Your best source for USED parts is probably one of the many people who are regularly parting-out these tractors on ebay. Ebay is not my favorite place to shop, but I have had very good luck with nearly every tractor person I have dealt with. 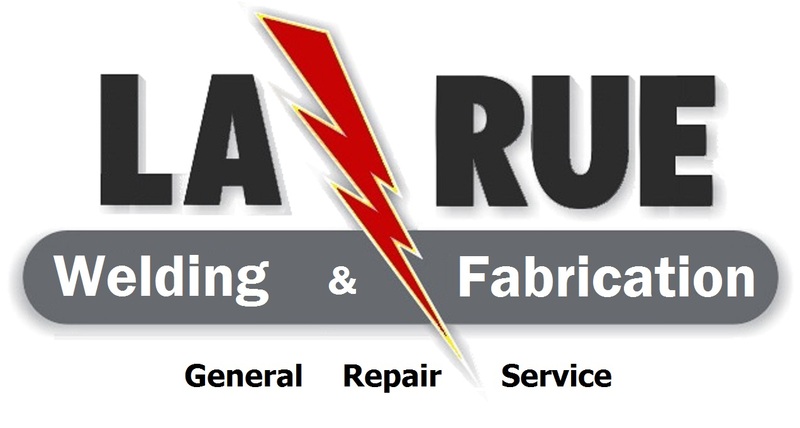 Tune up parts and accessories are available from places like NAPA, Tractor Supply Company, or even your local New Holland Tractor dealer. Generally, I've found parts from various local retail stores to be inferior. Most replacement parts are now made in China. Some are good quality. Some are junk. If you are not satisfied with the quality, buy from a different place next time. Beware cheap parts. If the sign says "CHEAP TRACTOR PARTS", that is what you will get. The cheap stuff may work, but probably won't fit right, or last as long. Be sure to ask if there is more than one option. Spend a little more if you can get "New Old Stock" (NOS), "restoration quality" or "Just Like Original" (Dennis Carpenter Brand) parts. What follows is a list of basic parts and part numbers that most parts counter people should be able to cross reference. Having the correct part numbers helps any web search drill down to the correct items. Ignition Switch 9N 3679 I'm using marine grade ON-OFF toggle or key switches. Light Switch 9N 11652 Same here, any marine grade switch is better than replacement parts made for this application. The following two fittings are the adapter fittings that will be needed to hook most oil gauges to the flare fittings on the steel oil line. The designation NPTF stands for National Pipe Taper Fuel. In theory, these fittings do not require sealant on the threads, they are designed to completely seal mechanically. That's great in theory, but I still use a thread sealant for gas systems, especially when re-using one side or both sides of a connection. The sealant for gas systems is yellow in color rather than the white teflon stuff for water pipe fittings. Prices quoted below are approximate. Check current average on-line prices (plus shipping) and you will have a ballpark idea what I will sell parts for. Listed below is most of the parts currently lurking around the shop. Lower Lift Arms I only have one ratty pair with chunks of scrap reinforcing welded to them. This is not a tractor part, but no man cave should be without one. I believe the only way to get one of these mugs was to buy a full set of Cragar rims in 1982. This was an advertising promotion. 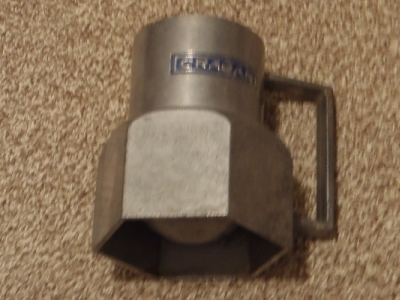 Buy a set of four rims by November 1, and get the Cragar Chug A Lug mug free! This one is in very good shape, with most of the blue paint still on the logos. This one could be yours for only $60, shipped free to anywhere in the USA. International shipping will add $35. I will refund what is left after paying actual shipping cost. 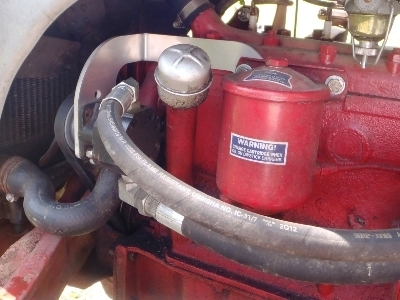 The N-Tractor hydraulics will not raise the implement when the clutch is depressed. This is nothing short of a royal pain when using a back blade and other implements. The solution is to provide hydraulic pressure from an external pump. I have some custom-made brackets that allow a hydraulic pump to be mounted and run off the same belt as the generator/alternator/water pump. The latest one-piece design is machined from 1/4" thick aluminum plate and (as requested) now has a dual-mounting flange that works for 2-bolt and 4-bolt pumps. Warning, most 2-bolt pumps appear to be larger than the 4-bolt pumps I use, and there is not a lot of room on these engines. I recommend using the 4-bolt pump, but you are certainly welcome to try an get a 2-bolt pump to fit. 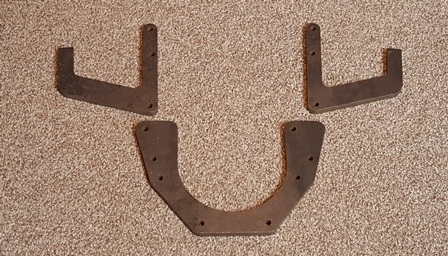 PUMP BRACKETS - BUY IT NOW ! PayPal buttons below are the easiest way to get one of my pump brackets and the cheapest way to get one from a machine shop. Even buying only 10 at a time gets the price much lower than the $150 or so they want for a single. The cheapest way to get a bracket is to scroll down to the plans, and make your own. For any special request, or payment by check, use the contact form at the bottom of this page. Turn-around time is usually one or two evenings unless I'm out of town. TRAVEL NOTICE! I will be out of town October 4th thru the 9th, 2019. Price includes priority shipping to anywhere in the USA. Selecting International Shipping will add $35.00. I will refund any dollars left after paying actual international shipping charges. 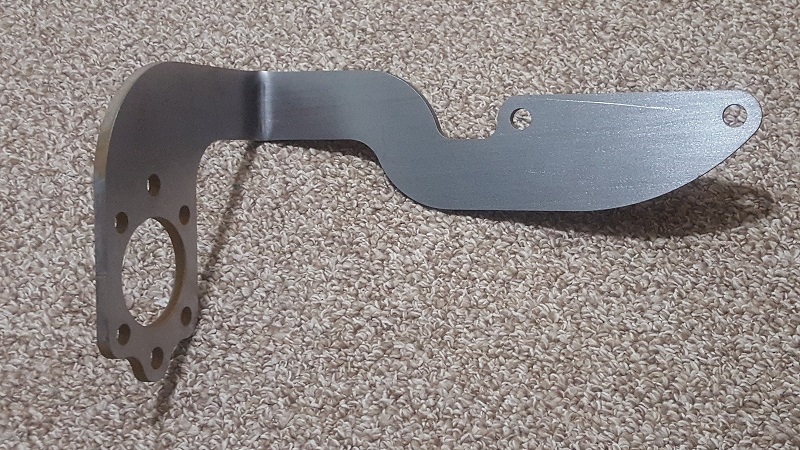 $95.00 - This one piece 1/4" thick STEEL bracket has been redesigned to drop down around the front corner of the cylinder head that can be drilled and tapped for a temp sending unit. None of these tractors had temperature gauges, but some people have installed them. 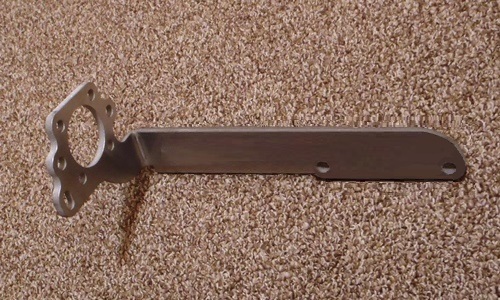 This bracket will come painted primer gray so you can paint it to match your tractor. For any special request, older bracket designs I may have laying around, or payment by check, use the contact form at the bottom of this page. 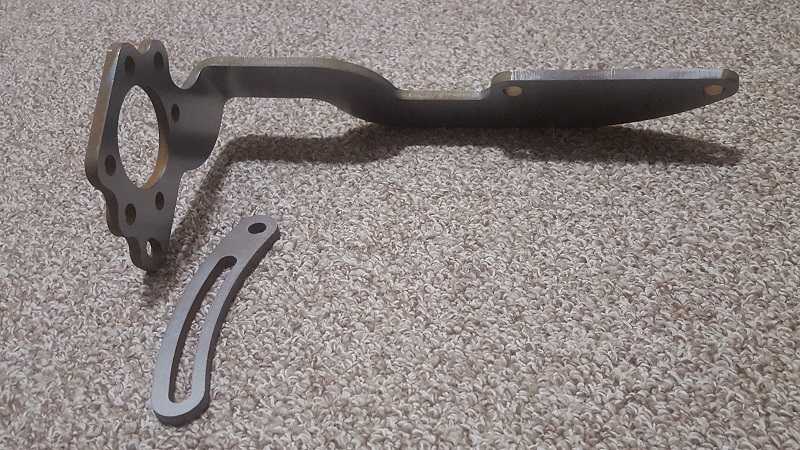 The new steel brackets are really cool! There are times when factory original parts are not available. The old part may be too far gone to fix it, or missing. There are also cases where something non-standard is needed. 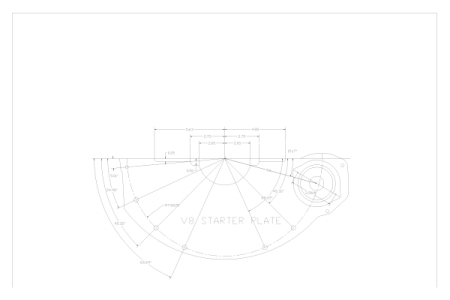 Photos of the CAD drawings I created from scratch to make a set of 1949 Ford Flathead to 8N Tractor Transmission adapter plates. If you are looking for a CAD drawing, this link should allow you to download a 2004 DXF file that can be imported to most CAD software. 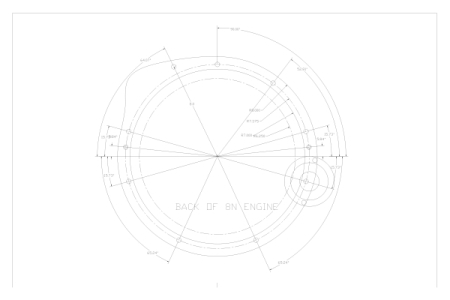 Please keep in mind this is a measured drawing, from the engine and transmission. These were NOT based on factory drawings of these parts. The drawing will be updated if any errors are found. 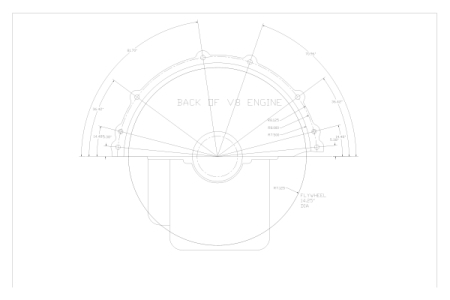 The parts I had made from these drawings worked for my V8-8N project.